The head of a flower is made up of small seeds which are produced at the center, and then migrate towards the outside to fill eventually all the space (as for the sunflower but on a much smaller level). Each new seed appears at a certain angle in relation to the preceeding one. For example, if the angle is 90 degrees, that is 1/4 of a turn. Of course, this is not the most efficient way of filling space. In fact, if the angle between the appearance of each seed is a portion of a turn which corresponds to a simple fraction, 1/3, 1/4, 3/4, 2/5, 3/7, etc (that is a simple rational number), one always obtains a series of straight lines. If one wants to avoid this rectilinear pattern, it is necessary to choose a portion of the circle which is an irrational number (or a nonsimple fraction). If this latter is well approximated by a simple fraction, one obtains a series of curved lines (spiral arms) which even then do not fill out the space perfectly. In order to optimize the filling, it is necessary to choose the most irrational number there is, that is to say, the one the least well approximated by a fraction. This number is exactly the golden mean. The corresponding angle, the golden angle, is 137.5 degrees. (It is obtained by multiplying the non-whole part of the golden mean by 360 degrees and, since one obtains an angle greater than 180 degrees, by taking its complement). With this angle, one obtains the optimal filling, that is, the same spacing between all the seeds. This angle has to be chosen very precisely: variations of 1/10 of a degree destroy completely the optimization. When the angle is exactly the golden mean, and only this one, two families of spirals (one in each direction) are then visible: their numbers correspond to the numerator and denominator of 2 consecutive numbers in the Fibonacci sequence, which is proved to converge toward the Golden Mean value of 1.6180339... (in the picture we have 21/34, the 7th and 8th terms of the Fibonacci sequence). These numbers are precisely those of the Fibonacci sequence (the bigger the numbers, the better the approximation) and the choice of the fraction depends on the time laps between the appearance of each of the seeds at the center of the flower. 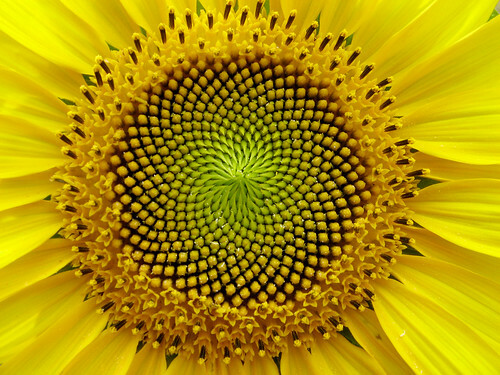 This is why the number of spirals in the centers of sunflowers, and in the centers of flowers in general, correspond to a Fibonacci number. Moreover, generally the petals of flowers are formed at the extremity of one of the families of spiral (true, I count 34 for this sunflower). 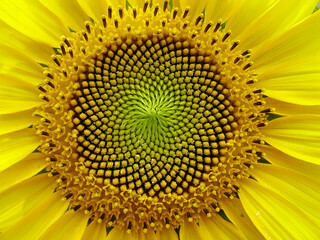 This then is also why the number of petals corresponds on average to a Fibonacci number.